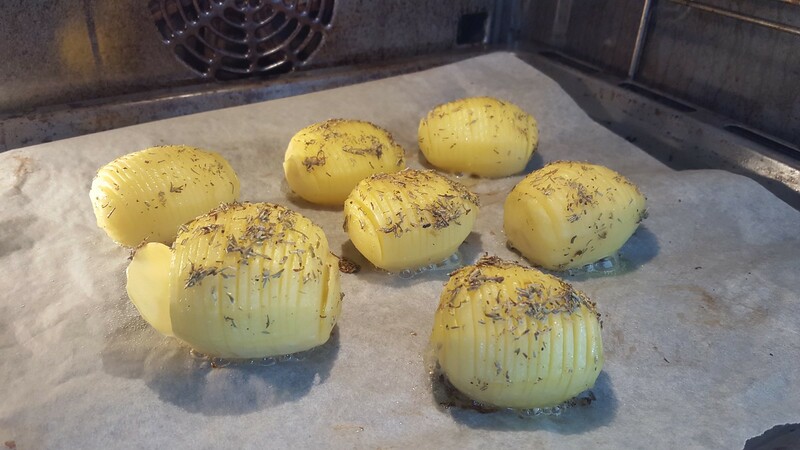 Recipe for Hasselback Potatoes - The best and original Swedish recipe! 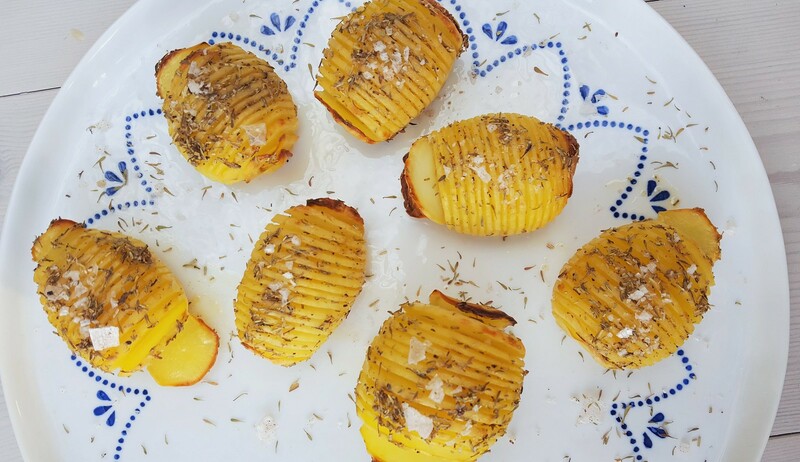 Easy recipe for Swedish Hasselback Potatoes. These potatoes are very popular in the Nordic kitchen and is a great side dish for a lot of different food. This recipe I have presented on this page is probably one of my top-3 ways of preparing potatoes. The recipe is an old and very traditional Swedish way of cooking potatoes. 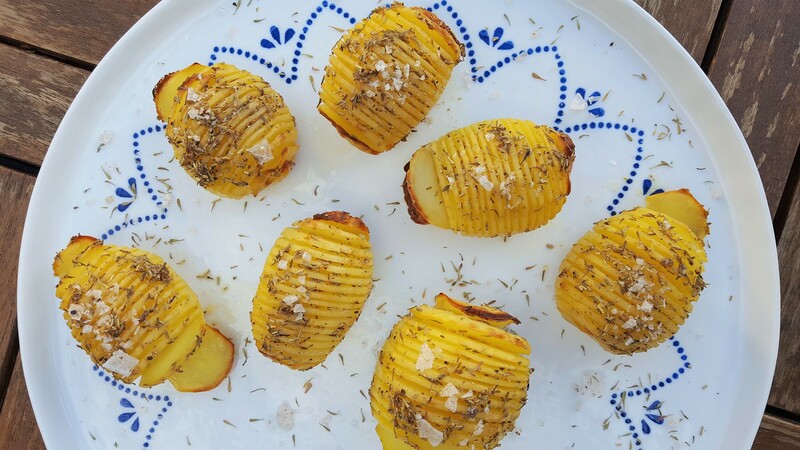 The name for this great side dish is in Swedish called Hasselbackspotatis. The English translation is a bit difficult. However, the name for the recipe could be translated to Hassel Baked Potatoes or maybe just Hasselback Potatoes. 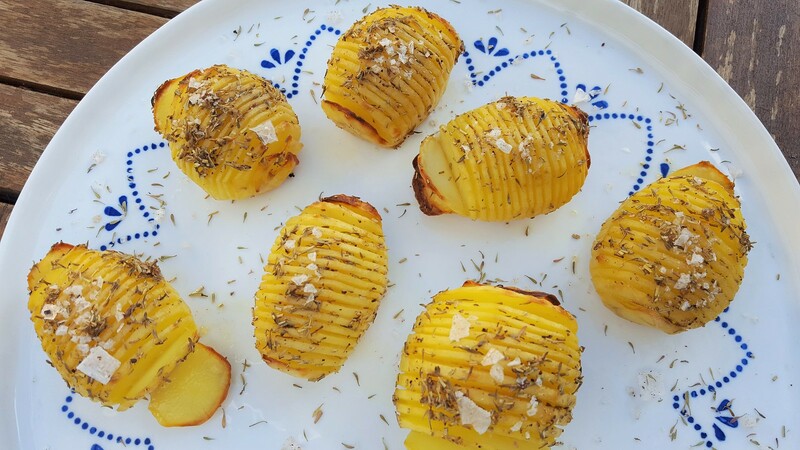 In Danish they are called Hasselback Kartofler or sometimes just Hasselbagte Kartofler. I have once been told that these potatoes originates back to a restaurant in Stockholm which made them the first time back in the 80s or 70s. However, I have not been able to confirm this story. These potatoes are super simple to make. 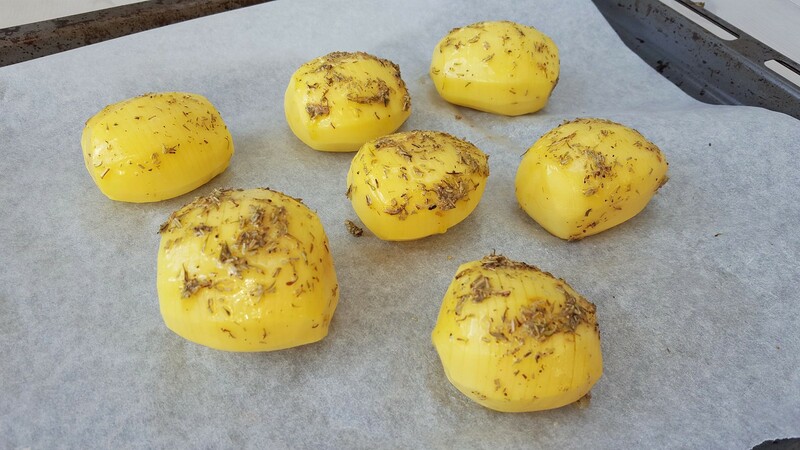 In general is all about making many deep cuts into some medium to large potatoes, brushing them with an herb and butter mixture and then baking them for some time. The cooking time is of course depended on the size of the potatoes. 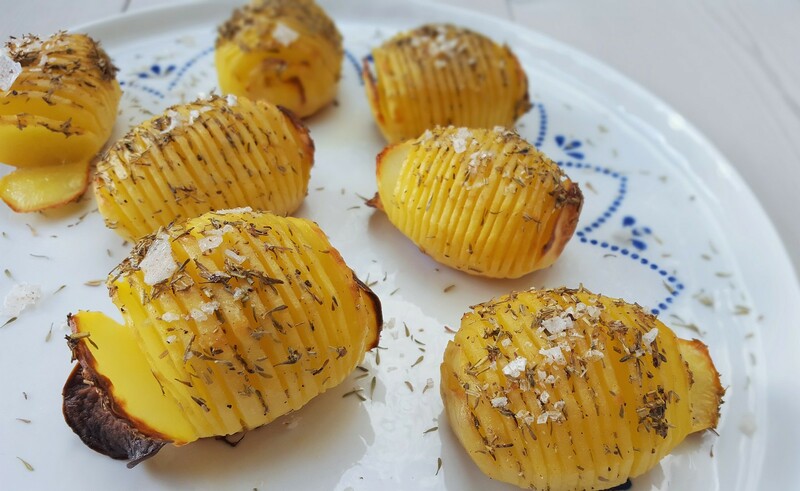 The delicious thing about these Hasselback Potatoes is that all the deep cuts in the potatoes creates a nice and crisp crust on the outside and at the same time keeps the potatoes nice and soft on the inside. 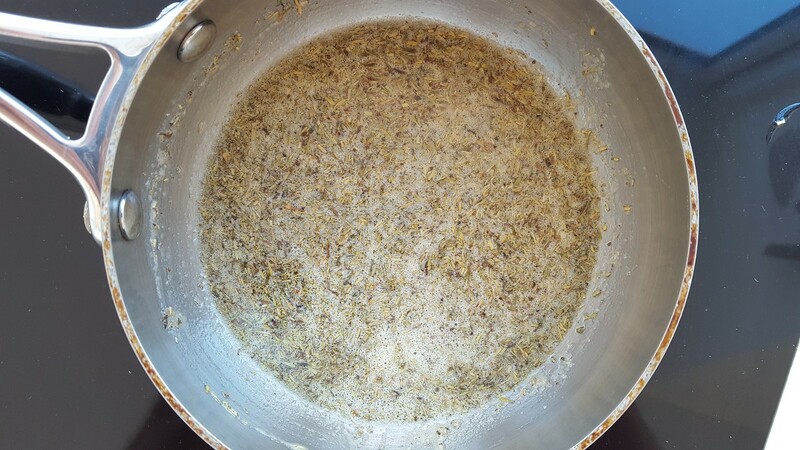 The butter and herb mixture gives the potatoes a fresh and special taste. I simply love these potatoes. I normally serve these potatoes together with some meat and a nice salad. They go especially great together with this a pork tenderloin or a Danish Roasted Pork. I can easily remember having had these potatoes since I was a little kid and I remember that I loved them. I especially remember that I loved to help making these potatoes. It is somehow fun to make all the deep cuts in the potatoes. This is a simple and traditional Swedish recipe and I will absolutely recommend you to try them. In a sauce pan; melt the butter at low heat. 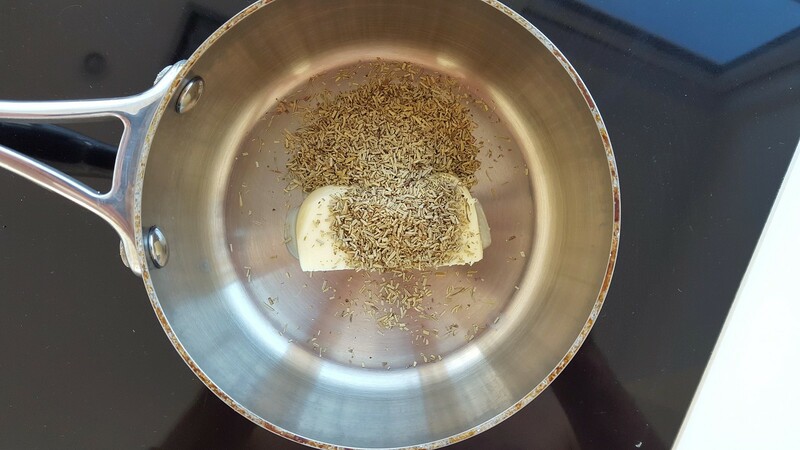 When the butter is melted; chop the herbs and garlic and add it to the butter. Let it cook/sit for about 5-10 minutes on very little heat. Clean and peel the potatoes. 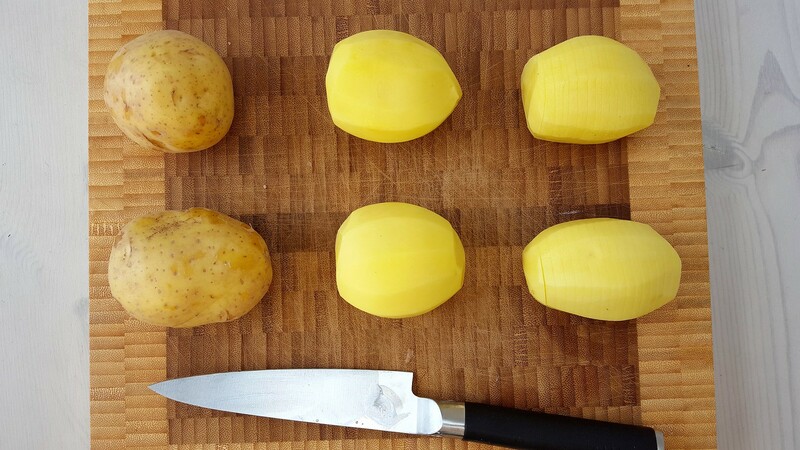 At the bottom side of the potatoes make a small horizontal cut. This will make sure the potatoes sits stable on the oven plate. On the opposite side; make deep cuts side-by-side into the potatoes. The cuts should be about 2/3 into the potatoes and about 2 mm apart. On a parchment paper covered oven plate; place the potatoes side-by-side with the grooves upwards. 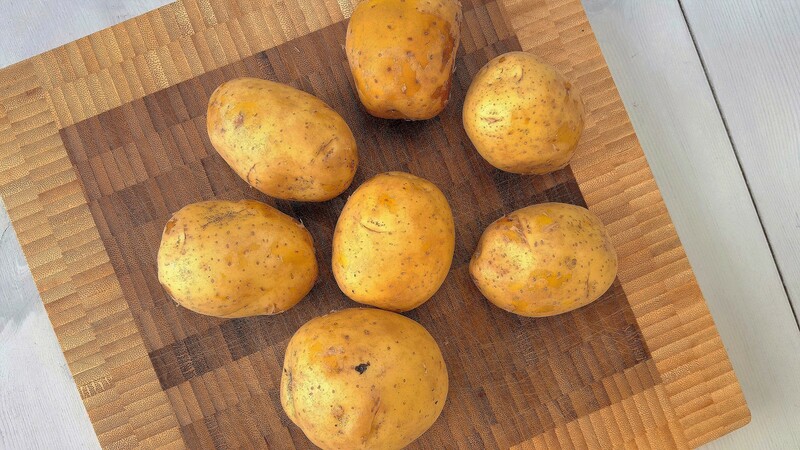 Brush the potatoes with the butter and herb mixture. Bake the potatoes for about 60 minutes at 200 C (400 F). The cooking time is depended on the size of the potatoes. The potatoes are done when you can easily stick a fork into them. During the cooking brush the potatoes 2-3 times extra with the herb mixture. My Norwegoan Grandmother did this wonderful recipe but to any remaining herbed butter she would add crushed crackers ( I use Ritz) and toss well. Then in the last 15 min. or so of baking she would sprinkle a very little bit on top of each to add a golden brown sparkle to the top. Also , I use Yukon Gold potatoes for color. And if I’m serving them on a Smorgabord of many foods, I cut the larger potatoes in half before preparing as above. This recipe sounds wonderful. We have this for Swedish Christmas eve. I am trying to help my mom with cooking as much in advance as possible. Do you think I could make this the morning of Christmas eve, put in a crock pot to keep warm for later in the day? That sounds great. I actually think you can do that – I can’t see the problem in that.